Half a world away from home in Moscow, Team KIMbia hit the track at the 2013 World Championships, in a variety of distances. Kicking things off on Sunday, Shalane Flanagan led the early proceedings in the 10,000m final before coming home in 8th place. Looking to ensure the steady and honest early pace likely to suit a strong, rhythm-running marathoner such as herself, Flanagan ran three straight kilometers around 3:07 — 31:10 pace — before Hitomi Niiya of Japan took the lead and began to pick things up. As the lead pack broke up, Flanagan was gapped a few laps later but soldiered on in “no man’s land” and clocked a 31:34. In the first round of the men’s steeplechase, Evan Jager executed the race one would expect from a medal-hopeful: conserve energy early, break things open late, cruise home safely in an automatic qualifying position. Running in the second of three heats, Jager followed an early 8:37 pace with a big pack still in the hunt. After moving up with just over a lap to go, Jager and defending Olympic champion Ezekiel Kemboi were clear of the field by the top of the final straight; securely in the top three, Kemboi slowed and did his trademarked drift to the outside lanes, allowing our Chicagoland-native to finish first in 8:23. Thursday’s final will feature four Kenyans, the European record-holder and Olympic silver medalist, and two Canadians, among the fifteen competitors. Jager holds the seventh-fastest lifetime best and the fifth-fastest season best in a field that contains virtually all of the heavy-hitters who started the rounds. That final goes off at 12:20pm EST. 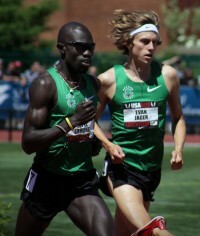 Lopez Lomong finally took to the track to contest the first round of the men’s 1500m. In an absolutely loaded heat, Lomong faced-down world-leader/2008 Olympic champion/reigning World Champion Asbel Kiprop, 2012 Olympic bronze medalist Abdalaati Iguider, 2008 Olympic silver medalist Nick Wills, and the 800m bronze medalist from these championships, and safely secured one of the six automatic qualifying positions. Placing third in the heat, Lomong now moves onto a semifinal to be held on Friday, where he landed in the first of two heats and will need a top-five finish — or one of the two fastest times outside of the automatic qualifying spots in both heats. Also on that starting line will be Kiprop, Willis, 2012 Olympic silver medalist Leo Manzano, Daegu silver medalist Silas Kiplagat, and a pair of 3:31 men.